I recently had a discussion with a woman who was complaining of severe and chronic constipation. She asked me what to do. When discussing her diet, she admitted that bread, pasta and desserts, all made with processed white flour, are her weakness. Now I know that this isn’t an appetizing topic, especially when you probably came here around mealtime looking for a delicious recipe, but the fact is most Americans eat far less than the recommended 25 to 35 grams of fiber per day. Fiber is extremely important in preventing constipation. It’s no wonder that this is an extremely common condition. Eating a diet rich in fruits, vegetables, legumes, whole grains, nuts and seeds can give you the fiber you need. Eating a diet high in meat and processed grains will leave you falling way short. Meat has zero fiber since fiber only comes from plants. A slice of white bread only has 1 gram because processing the grain removes the fiber-rich bran. A raw pear, on the other hand, provides 5 grams of fiber. Just one serving of this delicious smoothie made from fiber rich pears, apples, figs and chard, delivers a whopping 11 grams! Fiber also has been shown to reduce cholesterol and help prevent hardening of the arteries and cardiovascular disease. It also helps keep blood sugar levels under control which is very important for people with diabetes and hypoglycemia. Fiber can also help prevent colon cancer because it quickens the removal of toxins from the large intestine. Are YOU getting enough fiber? If not, consider adding more to your diet but remember to add it gradually to prevent any GI distress and remember to drink lots of water. 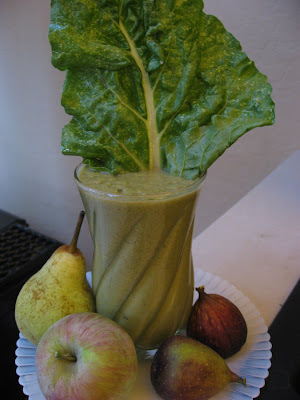 Doug and I start almost every morning with a smoothie made from raw fruits and vegetables.Today's recipe is a good one to try right now since apples, pears and figs are at their peak flavor and availability. If you are lucky like we are, you may have some generous neighbors offering you these freshly picked ingredients from their trees. Besides the fiber rich fruit, I always like to add some greens to my morning smoothie. Chard is a super star. Besides being high in fiber, it is an excellent source of vitamin A, C, E, K, iron, magnesium, potassium and manganese and a very good source of vitamin B2 (riboflavin), B6, calcium, phosphorus and copper. I've added both flaxseed oil and hemp milk to this recipe to give you significant amounts of essential fatty acids. One serving provides nearly 3.0 grams of omega 3 and 2.6 grams of omega 6. Feel free to replace the hemp milk with soymilk, rice milk or almond milk. For a totally “raw” smoothie, replace it with your favorite raw nut milk. For a “live” experience, use probiotic-rich goat Kiefer or yogurt. Place all ingredients in a high speed blender and blend until smooth. Serve immediately. Per serving: 303.3 calories, 7.6 g fat, 0.6 g saturated fat, 0 g cholesterol, 3.0 g protein, 66 g carbohydrates, 11 g fiber, 2.9 g omega 3 and 2.6 g omega 6 fatty acids. Organic white whole wheat flour. 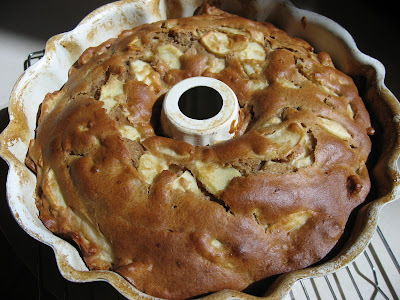 Fill well greased bundt pan with apple pear batter. Remove bundt pan from oven after 50 minutes, when golden. This recipe could also be used to fill two 8.5" x 4.5" loaf pans. How better to celebrate my 100th post than with this healthy, organic, whole grain cake filled with fresh apples and pears. Thanks to all of you around the world who have been following my blog and have committed to living a healthier life style. I hope I've showed you that you can fuel your body with healthy and nutritious food without having to sacrifice taste, visual appeal or satisfaction. Your visits to my site inspire me to continue my work creating recipes and writing articles on healthy eating. Now you can have your cake and eat it too - literally. For those in your family who dislike the taste and texture of whole wheat, you can now use a flour with all of the nutrition and fiber of whole wheat and still enjoy the taste and delicate texture of white flour. 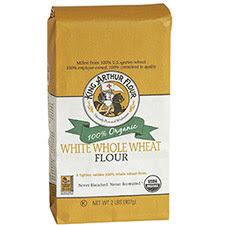 King Arthur brand offers both organic or non-organic white whole wheat. If your store doesn't carry it, you can buy it on their website. This whole grain wheat is made from a combination of hard white winter and spring wheats. You can use it to replace white flour in any recipe. If you cannot find white whole wheat flour, you can make this recipe using 1/2 white flour and 1/2 regular whole wheat flour. This recipe has 4 eggs. If you are worried about cholesterol, you can replace some or all of them with egg whites (2 egg whites for each egg) but it's a big cake with 20 servings so each serving only has about 40 mg of cholesterol. If you use eggs, please make sure they are organic, cage free, omega 3 eggs. The freshest eggs usually come from your local farmers. Actually, the best eggs come from your very own chicken, as many of you know. Preheat oven to 350 degrees. Toss the apples and pears in Fruit Fresh produce protector and set aside. 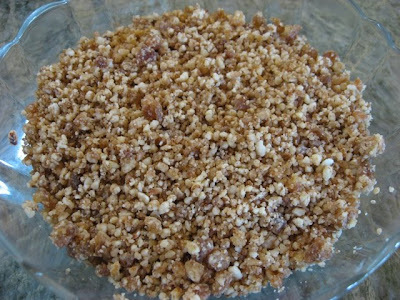 In a large bowl, mix flour, baking powder, baking soda, salt, cinnamon and nutmeg and set aside. 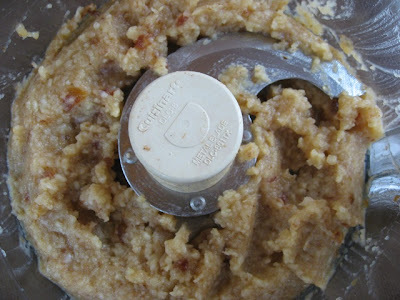 In a separate bowl, combine, eggs, olive oil, apple sauce, vanilla and sugar and mix thoroughly. Pour the egg mixture into the large bowl with the dry ingredients and blend well with a hand mixer. Using a rubber spatula, fold in the apples and pears. Pour into a well greased bundt pan or 2 well greased 8.5" x 4.5" glass loaf pans. Cook until golden and a toothpick comes out clean when inserted. The bundt cake will take about 50 minutes and the loaf pans will take about an hour (or less if you use metal pans instead of glass). Remove from oven and place on a rack for 15 minutes before removing from the pans. Let cool at least another 15 minutes before cutting. Per serving: 161.4 calories, 6.8 g fat, 1.1 g saturated fat, 42 mg cholesterol, 3.4 g protein, 22.2 g carbohydrates and 2.5 g fiber. Low fat, vegan, non-GMO tofu hot dogs with zero cholesterol. Uncured chicken hot dogs without nitrites. High fiber, organic, sprouted hot dog buns. 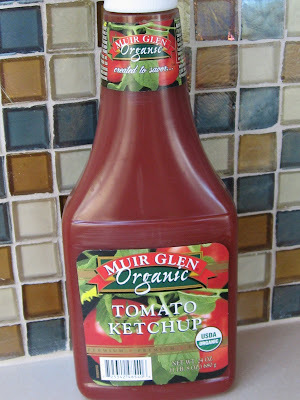 Muir Glen organic ketchup without high fructose corn syrup. Is "Healthy Hot Dog" an Oxymoron? It doesn’t have to be. Just because you prefer healthy food or became a vegan or vegetarian, doesn’t mean you don’t enjoy eating a healthy version of one of America’s favorite foods. Don’t get me wrong, hot dogs can be very unhealthy. Often filled with “mystery meat”, they are generally full of nitrites, salt and fat and placed on a white bun with zero fiber and little or no nutritional content. #1 Avoid hot dogs containing nitrites. Used as preservatives, sodium nitrite (or nitrate) can be converted into the carcinogenic chemicals called nitrosamines. These have been associated with various cancers. The healthier hot dogs will specifically say, “UNCURED, NO NITRITES”. #2 Avoid red meat. The American Institute for Cancer Research recommends limiting the consumption of red meat to 18 ounces per week. Today there is a wide selection of tasty hot dogs made from non-GMO tofu, chicken and turkey. # 3 Watch the sodium content. The RDA for sodium is 2,400 mg per day and people at risk for high blood pressure, heart attacks and strokes, should limit their consumption to 1,500 mg per day, according to the CDC. #4 Select one low in fat, especially saturated fat. Just because a hot dog is made from chicken or turkey, don’t assume it’s low in fat. Some of them are just as high in fat as their beef and pork counterparts so it’s best to read the label. Try to select one with 2 or less grams of saturated fat. Some tofu hot dogs are extremely low in fat and contain zero cholesterol. #5 Choose whole grains over processed white bread. The fiber content is key. Although some tout “whole grain”, they are mostly made from white flour. Try to find one that has at least 2 to 3 grams of fiber per bun. Sprouted wheat is the best choice as it is made from “germinated” wheat. #6 Avoid high fructose corn syrup. Although the amount of HFCS in a bun wouldn’t cause much harm, I personally do not support an industry that has contributed so greatly to the obesity epidemic in this country. #7 Avoid trans fats. Most baking companies have removed trans fats from their products but you should check the ingredients for partially hydrogenated oils. Trans fats have been associated with an increased risk of coronary heart disease. 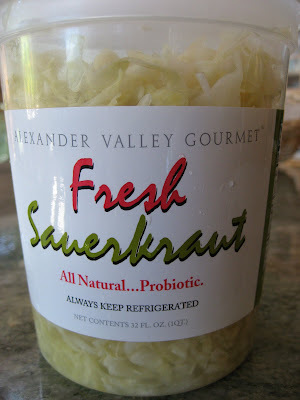 #8 Try raw sauerkraut, rich in probiotics. I’m very happy to see “unpasteurized, raw sauerkraut” in the refrigerated section of Whole Foods and other health food stores. Get all the benefits of cabbage (a cruciferous vegetable that is known to protect us from various cancers), while obtaining healthful probiotics (beneficial bacterium found in our intestinal tracts). Look for brands with lower sodium content. You could even try making your own with a simple sauerkraut maker . #9 Opt for mustard or organic ketchup over high fat, high cholesterol mayonnaise. Beware, some ketchups are sweetened with high fructose corn syrup. #10 Or top the hot dog with low fat, vegetarian bean chili. This heart healthy topping is known to help control blood sugar and lower cholesterol due to its high content of soluble fiber. So go enjoy a nice tofu or low-fat, uncured chicken hot dog on an organic sprouted wheat bun with raw sauerkraut and spicy mustard or vegetarian chili WITHOUT the guilt! Just don't ask for one like this at a baseball game - you will surely be escorted out. The World Health Organization claims that iron deficiency is the number one nutritional disease in the world affecting 30% of the population. Although many of the 2 billion affected are women and children in third world countries, iron deficiency is also prevalent in industrialized countries. Children, young girls and women of childbearing age are most “at risk” in the United States. The most important use of iron in our bodies is to form hemoglobin – a molecule in our red blood cells that carries oxygen throughout our system. If there is not enough iron in your diet, you run the risk of developing iron deficiency anemia. Symptoms of anemia include fatigue, headache, shortness of breath, brittle nails, irritability, sore tongue, paleness of the skin, dizziness, weight loss and unusual food cravings. Heme iron is the most easily absorbed form and only comes from animal products. Non-heme iron comes from plants and animal products. Plant sources contain 100% non-heme iron and animal products contain 40% heme and 60% non-heme iron. Because non-heme iron is less easily absorbed, vegetarians have a higher Recommended Daily Allowance of this nutrient. Even so, iron is so prevalent in the plant kingdom, with dietary care, vegetarians are no more at risk for iron deficiency than meat eaters. Phytates, commonly found in nuts, beans and grains, can reduce the absorption of iron. Soaking or sprouting these foods, which is commonly done in the raw food community, can reduce phytic acid making the iron more bio-available. If buying bread or cereal, choose “sprouted” grain when available. Tannins also decrease the absorption of iron and are found in black tea, coffee and wine. You may want to have that glass of wine before your iron-rich meal and skip the tea and coffee until much later. Calcium should also be avoided when trying to optimize iron absorption. Calcium supplements should be taken several hours before eating an iron rich meal and calcium rich beverages such as milk should also be avoided during the meal. Low stomach acid and antacids reduce iron absorption. Phosphates in soft drinks can also reduce absorption of this important mineral. Here is one more reason not to drink soda with a meal (or ever, actually). Vitamin C significantly enhances the absorption of non-heme iron. Citrus fruits, being high in vitamin C, improve iron absorption. When vegans and vegetarians eat many vitamin C rich fruits and vegetables, their absorption of non-heme iron can equal the absorption of heme iron by meat eaters. High vitamin C foods include: guava, kiwi, papaya, berries, citrus, orange juice, peppers, spinach, kale, broccoli, brussels sprouts, cauliflower, and greens to name a few. Don’t forget, this vitamin is very heat sensitive, so it’s always better to eat the fruits and vegetables raw or cook them “crisp tender”. Stomach acid also enhances absorption. The upper limit for iron is 45 mg a day which isn’t difficult to reach if your multi has iron, you cook with cast iron cookware and you eat fortified foods such as Total or Multigrain Cheerios. Excess iron has been known to cause constipation and GI distress. Iron toxicity symptoms include fatigue, headaches, nausea, shortness of breath, weight loss, dizziness, and a gray hue to the skin. A hypothesis exists that suggests excess stored iron may lead to heart disease in men and post-menopausal women. Younger women, who regularly decrease their iron store during menstruation, enjoy a lower rate of heart disease. This would explain why women’s rate of cardiovascular disease after menopause increases. Many health professionals now suggest that adults avoid iron supplementation unless they are anemic. Many multi-vitamins are available "without iron". Unfortunately, very little data exists on raw, sprouted grains. Iron is plentiful in both the animal and plant kingdoms. 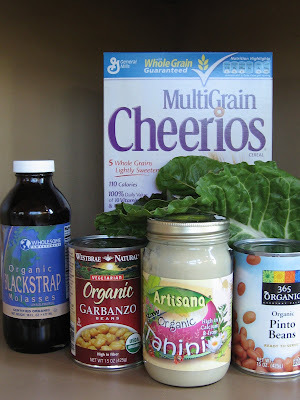 Vegans can get sufficient iron from plants by eating those high in iron and eating foods like fortified cereals. Iron absorption will increase with the consumption of foods high in vitamin C at the same meal. To optimize iron consumption, grains and beans can be soaked to lessen phytate content. Tannins, antacids and soda should be avoided and calcium supplements should not be taken at mealtime. 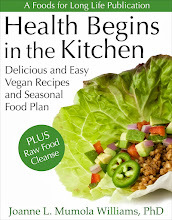 Raw food vegans (especially pregnant women or women of childbearing age) may have a harder time getting sufficient iron, especially if on a 100% raw food diet. If you are 80% raw or less, consider supplementing your diet with high iron foods like cooked beans and taking all of the other precautions listed above. Men and post-menopausal women should be careful not to supplement or eat too many iron-fortified foods unless they have iron deficiency anemia. An easy way to cut a mango. There was an article in the Wall Street Journal yesterday about the promising studies on the health benefits of omega 3. As I have pointed out many times, this fatty acid has been associated with reducing the risk of heart disease, which has been well publicized.This article also confirmed that there are studies considering the usage of omega 3 to treat or prevent Alzheimer's, epilepsy, rheumatoid arthritis and other serious conditions. Although the journal pointed out sources like salmon, mackerel, sardines, flax and walnuts, they neglected to point out some of the best vegetarian sources of omega 3 such as hemp and chia seeds (see my article on Best Fish and Vegetarian Sources of Omega 3 Essential Fatty Acids). All in all, I'm glad that public awareness is increasing on the many benefits of this nutrient. I've come across some wonderful, giant California mangos lately which I've been enjoying in salads and desserts. They are packed with vitamin A and vitamin C. They are also a good source of dietary fiber and vitamin B6. Here's a breakfast idea that takes advantage of the many benefits of raw mangos and also provides a large dose of omega 3 and omega 6 essential fatty acids. Each serving provides over 4 grams of omega 3 and over 5 grams of omega 6. With only around 200 calories a bowl, it also provides over 8 grams of fiber per serving. Try this healthy breakfast pudding and make it a mango morning! The night before, combine chia seeds with hemp milk and stir vigorously with a fork for a minute or so. Let sit for 15 minutes and stir again until the chia seeds are well blended and separated. Let the mixture sit out for an hour, stir one more time and refrigerate overnight until thickened and firm. In the morning, holding the mango so that the seed is vertical to the cutting surface, slice off half the mango. Turn the half over and, with the tip of the knife, score it into little squares being careful not to penetrate the skin. Then turn it inside out and cut away the squares. Do this to the other side. 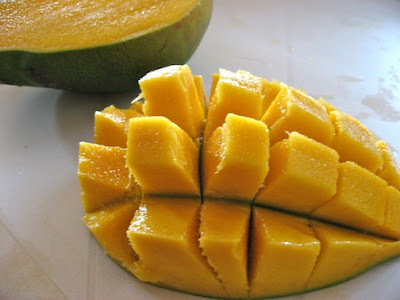 There will be some extra mango around the edges after doing both sides so just trim around and salvage what you can. 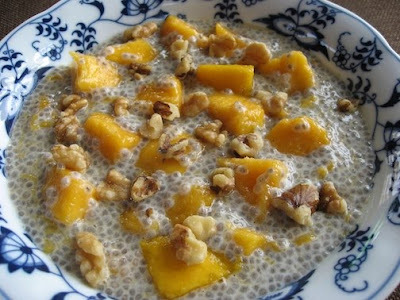 Stir the mango into the vanilla chia pudding. Divide into 4 bowls, top with walnuts and serve. Per serving: 206.3 calories, 12.8 g fat, 1.9 g saturated fat, 0 g cholesterol, 5.1 g protein, 31.3 g carbohydrates, 8.3 g fiber, 4.3 g omega 3 and 5.6 g omega 6 fatty acids. 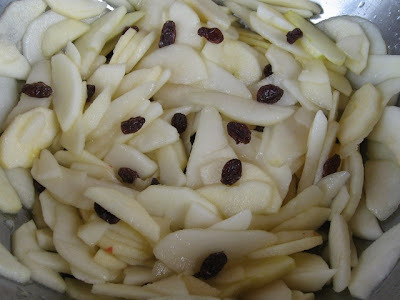 Pears, apples and raisins tossed with Fruit-Fresh produce protector. One cup of fruit processed with soaked dates and nutmeg. Raw crisp from processed walnuts, almonds and dates. Prepared fruit being topped with crisp. 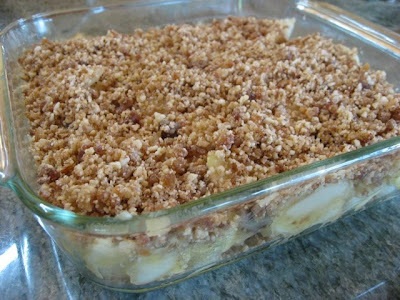 Completed pear and apple crisp in an 8 x 8 glass pan. We've got boxes of harvested apples and pears thanks to generous friends with fruit trees. We love making raw crisps (see my recipe for Raw Vegan Peach and Blueberry Crisp). Since we enjoy both apple crisp and pear crisp, Doug and I thought we'd try putting them together. 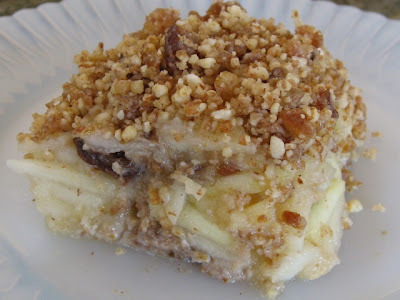 The juicy pears and crispy apples make a great combination. If you've never tried a raw crisp before, you won't believe how good it is. And healthy too. 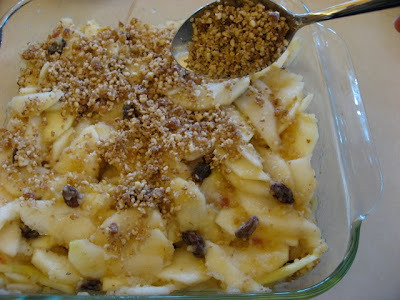 The crisp is sweetened by the fruit itself along with the Medjool dates and seedless raisins. There is no added sugar. Nor is there any butter. The only fat is that from the heart healthy almonds and walnuts. This dessert is low in saturated fat and has zero cholesterol and nearly 6 grams of fiber per serving. The walnuts alone provide almost 1 g of omega 3 per serving. Save money and make your own quick vegetable broth. This sugar pie yielded 5 cups of chopped pumpkin for my soup. Peeled pumpkin with seeds removed. 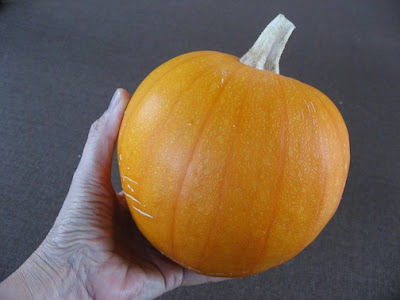 We grew quite a few little sugar pie pumpkins and although quite a few of them will make their way into pies, a healthier way to use them is in a soup. Since we still have a few boxes of Sebastopol Gravenstein apples, this recipe will also use some of these. You can also substitute winter squash for the pumpkin and other types of apples for the Gravensteins. Red, yellow and orange vegetables are full of antioxidant rich carotenoids. Although Beta-carotene is the most well known, hundreds of carotenoids have been identified. These antioxidants are believed to enhance our ability to fight cancer and other diseases. The power of these and other plant chemicals is enhanced when they are consumed together so it’s best to get them from food than to buy a vitamin pill that has isolated a single carotenoid, like beta carotene. * In descending Percent Daily Values (%DV) based on an adult 2,000 calorie diet. You can substitute ready-made broth in this recipe. But if you want to save a few dollars and use herbs from your garden and on-hand veggies, you can throw together a quick broth while you are preparing the rest of the soup ingredients. Whether you are vegan, lactose intolerant or you just want to save some calories, you can make your soup creamy by blending in potatoes instead of cream. Bring all broth ingredients to a boil in a sauce pan. Reduce heat and simmer, uncovered, while you prepare the soup (or at least 30 minutes). In a 5 or 6 quart Dutch oven, saute onion in the olive oil for 5 minutes. Add 3 cups of the broth (the above recipe may make a little more than that but only use 3 cups of it), the pumpkin, potato and salt. Bring to boil, then simmer until the pumpkin and potatoes are soft, about 15 minutes. Put the soup in a blender, blend until just smooth and return to the pot. Adjust salt if necessary. In a small sauce pan, saute apple in margarine and curry powder for 2 minutes, mixing continually. Divide soup in 4 bowls, top each with apples and freshly ground black pepper. Per serving: 171 calories, 4.1 g fat, 1.0 g saturated fat, 0 g cholesterol, 2.8 g protein, 33.9 g carbohydrates and 3.6 g of fiber.